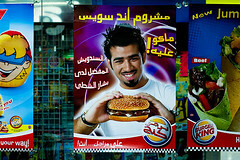 Yes thats Bashar, the first runner-up from last years Star Academy and yes thats a burger in his hand and yes its a Burger King ad. Bashar is now the new spokesperson for Burger King it seems. I think they are trying to copy Amr Diab in the Pepsi commercials. The biggest issue I have with this is that the burger in his hand isn't anything new. Its just the regular Mushroom and Swiss burger except with one meat patty instead of the regular two. Its not even a good deal. The single patty mushroom and swiss combo costs KD1.300 while a double patty XXL version combo costs KD1.350. For 50fils extra you basically get double the burger. Its a total rip off. Some people at the office seem to think Bashar sold out doing this commercial, I think if he made some money out of it, good for him, but now can we please have a new burger on the menu!! Oh by the way anyone remember the cartoon where the theme song went something like "bashar ya bashar haya ila il 3amalee".. Well I couldn't get the song out of my head now so I googled and I found a link to an MP3 version but its a Sasouki (the other cartoon) remix.. really weird click here to listen to it. am i the only that finds his image unsuitable to be a the spokeperson/face of a food company .. seriously what were they thinking! Bashar Ya Bashar comes from Na7ool. Don't u guys think the poster is too loud to look at @@ too many stuff on it with uncomfortable colors, in addition to bashar's spikey. Yikes! hmmm a bashar burger. what would that be made of? would be cool if we could suggest burgers to BK. That was a nice remix;-) thanks for sharing. Now, I can't take the song "bashar y bashar" off my mind, happy? I have to agree with Jandeef.. you have to look really well at the AD to understand why Bashar is there, which pretty DISTRACTING! so if you ever see more accidents on the roads. BLAME King-Bashar! i used to like bashar in star academy, not becaus of the way he looks, but because of his voice and smart clean thinking of music, but now after his new album, i feel angry because he didn't use his gift of music in making his songs any more better> any way i don't eat burger king that much and i don't think this add will make me eat more.